ജാടതെണ്ടി.കോം : Tattoo..to or not to?? I've never been a ornament person and hated women with lot of jewellery. I feel every ornament brings a sense of tied down effect on one. For how many times i have seen women in my family checking their necklaces and rings out. First to confirm if its there and secondly its at the right place. Thats one of the reason i am uncomfortable wearing a ring(the one ammamma gave me) as well . But these days i am attracted to tattoo's. Yes i consider even them as an ornament. It can be to make a statement or just a crazy fashion but its now my burning desire to get a tattoo. I have been thinking about the various designs like an Ashoka Chakra or the sanskrit scripture 'OM' or may be my sister's name on my shoulders or biceps. I really am yet to decide but ashoka chakra tops the list and for obvious reasons. And yes we are speaking about a permanent tattoo. One for the life..like picking a wife so must be extra careful aint it?? A friend of mine has a chineese symbol of 'Strength' tattoed on his leg calf muscles. 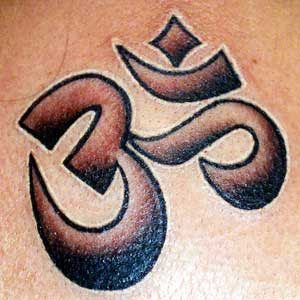 Now an 'OM' on my broad biceps would look bombastic and also will give me an urge to workout daily. So its like a Win-Win situation. The safety of a tattoo was the next point to investigate, but these days everyone is using sterilized needles and there are tattoo parlours who are masters at this craft. And they are not that costly for a simple design one just needs to make a booking in advance and maybe they will play around with the design here and there. But yes i need to hit the right frequency with the artist, i dont want him to fiddle around with my personal choices too much. Should i get it or not to?? If yes, which one is better an OM or Ashoka Chakra or you have any better ideas?? Asoka Chakra...is a nice idea..but are you a total Patriot?? the usual wriggling snake n all r too common. Go for something different. They say that once u've a permanent tattoo, u cant donate blood!!!! miniature india?? to include POK or not is the big question? '0' yeah i thought abt it..as its the first indian invention but maths aint my strong point. i think i have crossed the point of repending if i get a tattoo..
from what i guessed from amma and acha's expressions if u tattoo...u r screwed dear...!! How about a football? Liverpool FC or Steven Gerard will be even more better. Way to go Shabbu, go for the tattoo!!! I would say , no tattoo, if its true that you cannot donate blood once u tattoo..
Its probably late... but if it isnt then go for the 'om'. Thats what even Iam planning abt a yr from now.. .